GaryMoller.com - Health, Fitness - Naturally! 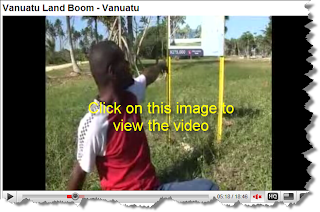 : When you visit Vanuatu, beware of the road works and the swindlers! When you visit Vanuatu, beware of the road works and the swindlers! Here's a video of the race around the island of Vanuatu that our hardy team of Kiwis and Okkers were heading over to have a crack at. We had it all organised earlier in the year only to be told just three weeks out that the race had been cancelled bcause of "road works"! Now I have heard of pathetic excuses; but this one sure takes the cake. More like the organiser has stuffed up big time in some way and is trying to save face. After the initial shock and disbelief at its cancellation, I have philosphically resigned myself to the fact that the event is no longer. After all, we are dealing with the chaos of a 3rd world country. We are heading over just one week from now and we will still have a good time. We are taking our bikes to explore the island. Cycling is a great way to make contact with the locals and to see the sights that one usually misses when travelling by car or coach. We will be keeping an eye out for those road works. And while we are exploring the island we will be lending our moral support to the islanders who are being ripped off by greedy Australians and a few Kiwis who are swindling the natives out of their lands. This is a common problem throughout the Pacific: Bribe a few politicians to create a tax haven for wealthy Australians, like ex PM Paul Keating; plus set up a system of 75yrs land leasing. Then pay off of few locals to register their tribal lands with the Land Court, then lease the lot for next to nothing to an Aussie property developer and it is all go! The first thing a village knows of this is when the bulldozers begin flattening their plantations to make way for a golf course and gated community or resort! This tragic situation reminds me of what one sees in increasingly lawless South Africa: A landless, itinerant work force that has little choice but to work for next to nothing. In this case: Vanuatuan men leaving their young families and old people at home while they spend several months a year slaving away in New Zealand picking fruit and pruning vines. This leads to the erosion of traditional Vanuatu life and the breakdown of the family and tribal units. New Zealand and Australia profit from this criminal behavour.